Plenty has been written on venture capital (VC), private equity (PE) and mergers & acquisitions (M&A) as subsets of the financial industry. Despite the extensive coverage the concept of deal flow (sometimes written as dealflow or even deal-flow) remains vaguely formalized - partly due to lack of coverage, and partly due to the fluidity of the concept itself. Then, what exactly is a “deal flow”? Why is it important to investors; GPs, family offices and business angels alike? Simply defined, a deal flow is the total amount of investment opportunities a company has, as per the consensus in definition from Wikipedia, Investopedia, and NASDAQ. Some pages don’t even define the term, even though they recognize its usage. Google Search’s own smart definition follows the same line as can be seen from the pic below. But that is still not clear enough. What is a deal? Don’t all businesses involve dealing of some kind? And what is this flow? Does “flowing” imply that the deals will consistently go from one place (or phase) to the next? Depending on the industry, a “deal” can mean different things. For early stage venture capitalists, a deal can signify a potential startup company that has, at the very least, expressed interests in being funded by investment firms. For private equity firms, it may refer to a company with potential to be acquired of taken over. And finally, for M&A teams, this may just mean potential companies to acquire or merge with. You can see part of the definition dilemma here. Since investing in a company is by itself already a fluid activity that morphs throughout the evaluation and negotiation process, and that adapts to the type of activities the firms cover, there is no one single way to tell when the interests (whether mutual or not) in a company start and end. Even though there is somewhat of a consensus on utilizing the term deal flow there is much less agreement on whether the deal flow consists of deals, opportunities, cases or investment opportunities, which all are terms referring to the target company that has a potential to be invested in by the investor. The definition dilemma is further complicated by the term “flow”. Unlike other businesses where the flow of opportunities (leads, sales leads, opportunities, etc) is scarcer, a typical investor faces a flow, and quite often an overflow, of investment opportunities causing a paradox: on the one hand each investor want to see as many deals as possible (for a classic FOMO or to build sector insight) and on the other hand most deals are clear “no-go”s causing extra clutter, headache and work creating very little value. The problem is not only the amount of investment opportunities, but also the natural complexity of the deal-making process. Depending on the investment opportunity at hand the companies can go through multiple different phases in the investment process and the negotiations can pause at any time, and very often for indefinite time. So we are optimistically aiming to steady deal flow, but in reality it’s more a long and winding road with occasional pit stops and u-turns. Companies who are in the business of selling have a big variety of CRM-systems to choose from, but investing is not selling. And what can be a great system to support selling is most likely less so for running investments. That’s probably one of the main reasons many investors still rely on spreadsheets to keep track of their deal opportunities. The idea of deal flow management is to ensure that investors get all the possible investment opportunities on their radar and get the best of them into their portfolio companies. Deal flow management is about finding potential companies, killing the not interesting investment opportunities as soon as possible and converting the interesting opportunities further into the deal flow and ultimately into investments quicker than the competing bidders. There is one simple fact to say about deal flow management: deal flow is your lifeblood and it has to be managed properly. Generally speaking, the more investment opportunities you are exposed to and the more structured data you have on them, the better-informed decisions you can make. However, since nobody likes data entry unless there’s an immediate benefit, this often gets neglected causing a lot of extra hassle further down the road. Bartosz Jakubowski - a VC in Paris, in one very well-written piece, agrees that although the concept of “deal flow” is sometimes too flexible to be useful, the more deals one VC can source and the higher quality these deals are, the higher returns the firm can drive for their LPs. Jakubowski also takes an interesting view on deal flow, thinking it as a funnel of leads, which is visualized in the pic below. This sentiment is further confirmed by Dave McClure from 500 Startups, in “99 VC Problems” and Hunter Walk, in “You Lose 100% of the Deals You Don’t See”. Simply put, the more exposure, the better and quicker capital utilization, less costs and more returns. The concept of “proprietary deal flow” is given fair treatment by Gil Dibner and Mark Suster, both important figures in the VC scene. The common perception is that some high-quality deals are made in exclusivity, and the more access to these deals the investors have, the better investments they will have in their portfolio. This, in turn, will generate higher returns to LPs, build firms’ reputation, and expand the proprietary deal flow, going full circle and creating a positive feedback loop. 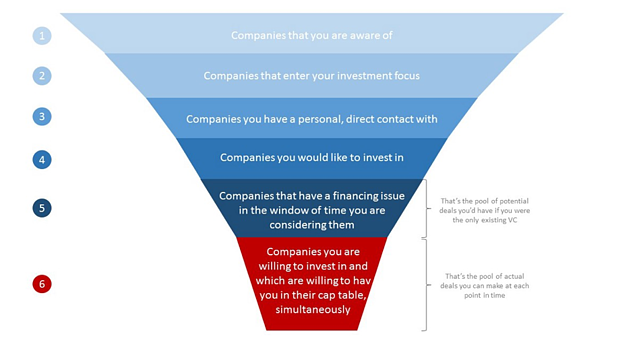 In brief, deal flow can be summed up as the funnel of investment opportunities. The larger the funnel, the more can come out at the end - in this case, more profitable investments to make. The real outcome is related to the efficiency and quality of the investor’s deal flow management process, which is what we will deal with in our next posts. Tune in!